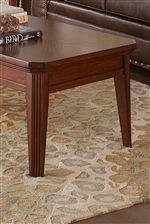 Envelop your bedroom in warm, rustic tones while adding necessary storage with this drawer chesser and mirror set. Seven drawers in the chesser allow you to tuck away bulky clothing and blankets, with a drop front drawer making the perfect home for a variety of media devices. 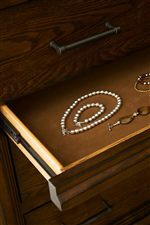 A sliding felt-lined jewelry tray in the right-side-facing top drawer protects your valuable and fragile items. 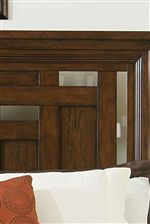 The mirror features beveled glass, and cutout detailing on the frame for a fresh, updated take on a traditional dresser mirror. Finished in a brown oak color, this drawer chesser and mirror set exudes warmth and casual style- the perfect addition to your relaxed bedroom decor. The Estes Park 7 Drawer Chesser with Beveled Glass Dresser Mirror Set by Broyhill Furniture at AHFA in the area. Product availability may vary. Contact us for the most current availability on this product.